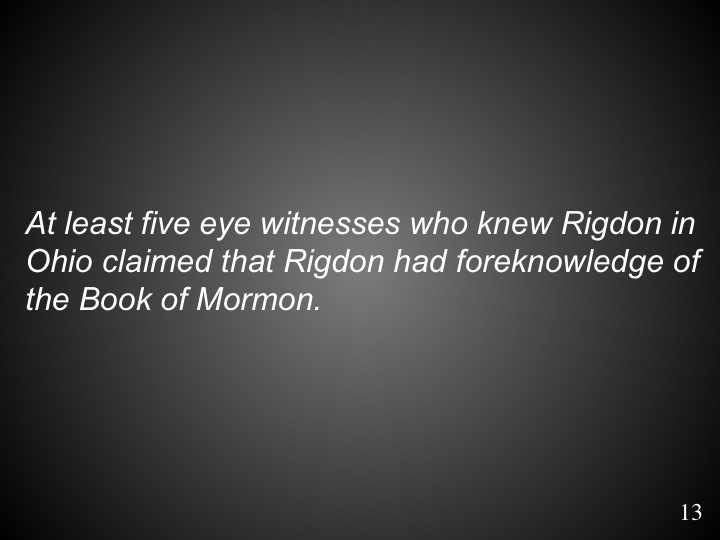 “For two years before The Book of Mormon appeared Rigdon’s sermons were full of declarations and prophecies that the age of miracles would be restored, and more complete revelations, than those in the Bible, would be given. When The Book of Mormon appeared, all who heard him were satisfied that he referred to it.” (Cowdery et al., 2005, p. 313). “My parents came to Ohio from Vermont in 1815. I resided in Kirtland when the Mormons first arrived. I was personally acquainted with Rigdon….I have heard [him] several times say in his sermons that before long the Indian mounds and forts about there would all be explained. He caused a row of log houses to be built on Isaac Morley’s farm, and established a Communistic Society before Mormonism was heard of. I heard Rigdon preach his first sermon at Kirtland Flats, and after he embraced Mormonism. He said that he had been preaching wrong doctrine and asked their forgiveness…” (Cowdrey et al., 2005, p. 313).